What’s New in Panopto 5.2? Video used to be unique, and not always in a good way. Video was harder to create than documents, spreadsheets, and presentations. It was harder to share, given its massive file sizes and the maximum size limitations of traditional content management system (CMSs) and learning management systems (LMSs). It was impossible to search in any detail. And editing a video required pretty advanced knowledge of specialized software. Today, however, video is increasingly like any other type of content — and that’s a good thing. 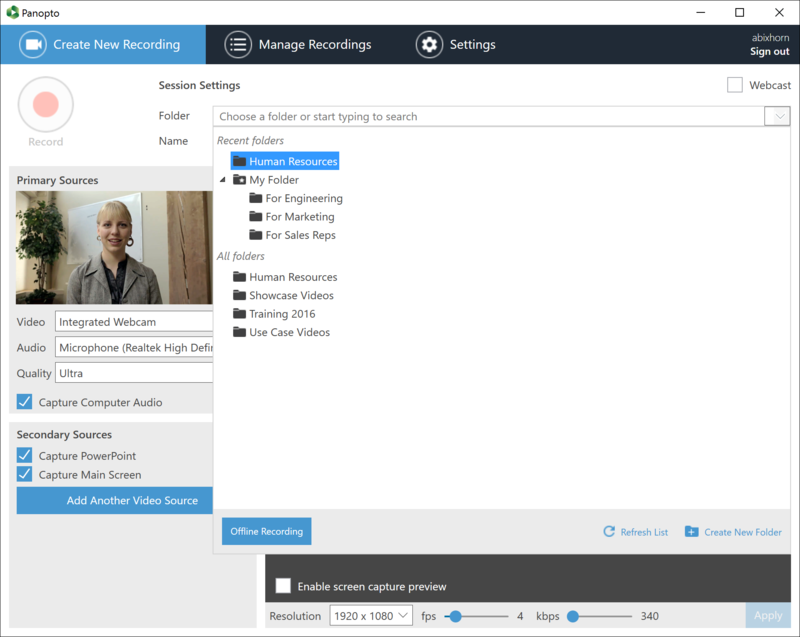 It’s easy to create on-demand recordings and even live webcasts using simple video capture software and commodity webcams. It’s easy to share videos in an “corporate YouTube”, also known as a video content management system (video CMS). And videos can now be searched as easily as documents and email using inside-video search technology. As businesses and universities increasingly adopt video as a preferred medium for learning and communication, we’re always thinking about ways to make video even easier. So today, we’re excited to announce the next release of our video platform, which makes it easier than ever to edit, personalize, and manage video within your organization. Here’s a look at what’s new. If you look at just about any video CMS currently in market, you’ll see that the content is organized primarily by administrators. Admins create a set of channels or folders to segment the videos. They assign permissions to those folders. And then, as they provision new users, they determine which folders the users can access. In some cases, the admin will also grant publishing permissions to folders, allowing users to upload existing videos or record new ones. This top-down model made sense in the past because, for the most part, VCMS users were only passive consumers of video content. 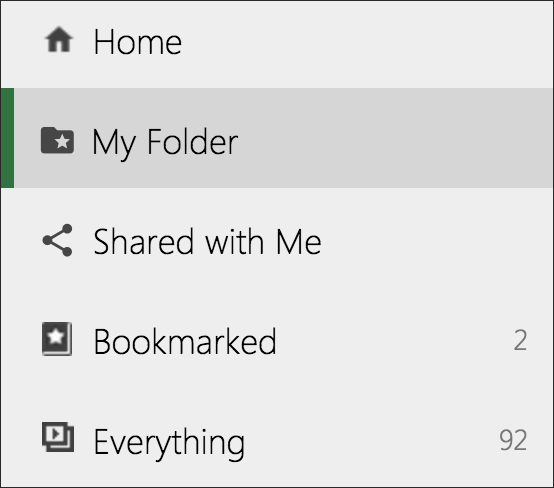 This model is in stark contrast to modern file sharing services like Google Drive and Dropbox. Within these services, you get a personalized view of your content universe. Specifically, when you log in to one of these services, the first thing you see is My Folder or My Drive — a private, sandboxed area that you can use to upload files and share them with other people. You also have concepts like Shared with Me and Starred, which provide easy access to the files that are most relevant and important to you. This user-centric approach to organizing information is increasingly applicable to video, as organizations embrace user-generated content and allow employees to create videos and share insights, ideas, and expertise with coworkers. In the years ahead, we expect a hybrid model of accessing organizational video to become the norm — one that blends the traditional top-down model with the user-centric approach introduced by file sharing services. A personal folder — Every Panopto user can now get a private folder for creating videos in a sandboxed environment. Admins can create personal folders for users automatically based on an identity provider setting, saving time that would normally be spent manually provisioning folders and granting permissions. Videos uploaded to the personal folder can be shared with other people or added to video approval workflows. One-click access to the most relevant videos — When users sign in to Panopto, they’ll see a personalized view of the videos that are most relevant to them. In one click, users can access videos in their personal folder, videos that have been shared with them by other users, and videos that they’ve bookmarked. 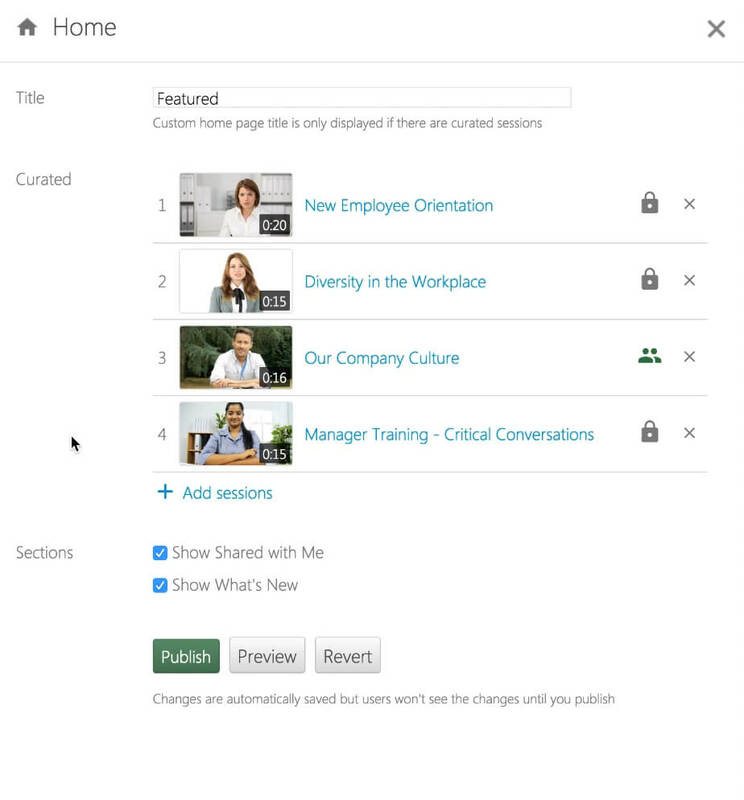 Personal View provides one-click access to the videos that are most relevant to usersPersonal View doesn’t replace the traditional model of admin folder creation and permission setting. Rather, it extends the top-down model with one that recognizes video CMS users as active participants in video creation and sharing. Just as personal folders provide individual users with a home base for their most relevant videos, the video CMS homepage should provide organizations with a destination for highlighting important and topical content. Featured videos, which can be easily curated by the administrator, appear at the top of the page. 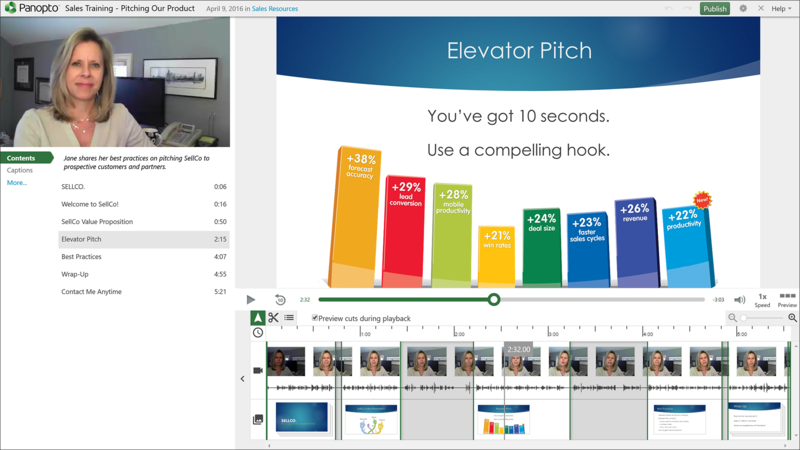 This is perfect place to highlight videos with broad relevance to employees, such as upcoming corporate webcasts, important training videos, and recent executive messages. Shared Videos presents each user with a view of the videos shared with them by other Panopto users. What’s New, as the name implies, presents a list of the videos most recently added to the VCMS. The new customizable homepage in Panopto 5.2We’ve built the homepage so that it can be customized in less than 3 minutes. Admins just click the Edit this Page button to launch a curation interface, and from there, can easily add featured videos from across their video library, set the order of the videos, and select whether to show the Shared Videos and What’s New playlists. Admins can customize the new Video CMS homepage in less than 3 minutes. In recent years, an increasing amount of storage and compute have moved to the cloud. Yet amid this shift, video editing has been a holdout — largely remaining an activity that happens on the client, using tools like Camtasia, PowerDirector, Adobe Premiere, and Final Cut Pro. These and other popular client-side editors all share four inherent challenges. First, they require you to download and install the app. For video editors, this often requires a hefty amount of hard disk space — typically 4 to 8GB for the apps listed above — and a respectable graphics card. It also means that you’re limited to editing videos on that one specific computer. If you’re on the road or away from your video editing machine, you’re out of luck. Video files: Not known for their diminutive sizeIf you assume most videos will be at least 5-10 minutes long, you’re already looking at more than 1GB per file. And when you consider that many presentations, training sessions, and town hall events can run 30-60 minutes, it isn’t be uncommon to have video files on the order of 10 to 20GB. Without getting into the nitty gritty details, there are indeed many video file format standards, and unless you understand how they work, the video you produce may not be compatible with your users’ web browsers and mobile devices. Even more critically, many client-side editors require a level of video experience that most of us simply don’t have. Apps like those listed above come packed full of features like masking, tracking, frame rate conversions, and frame blending. They’re perfect for professional AV teams, but complete overkill for the rest of us who simply need to make a few cuts, top and tail, update a title or a table of contents listing, and move a few clips around on a timeline. To overcome these challenges, Panopto 5.2 includes a new cloud-based video editor. We built the editor so that anyone could use it without prior AV experience. It’s written entirely in industry-standard HTML5 so that it runs in any modern web browser. That means there’s no need to download and install client software, and no reliance on browser plugins like Silverlight and Flash. The new Panopto video editor — no browser plugins required.Because all editing happens in the cloud, you can edit your videos from any computer, anywhere in the world. So if you’re on the road and don’t have your souped-up ASUS ROG GL551 or your Acer Aspire V Nitro laptop, no problem. In fact, even if all you have is a lightweight Chromebook, you can still edit Panopto videos. The other benefit of being cloud-based is that you don’t have to mess with massive video files taking up space on your actual computer. In fact, if you record video in Panopto, it’s automatically uploaded to the cloud in the background. Almost instantly after the recording is complete, you can start editing it. For web browsers, we create an encoding that supports multiple video streams, interactive note taking, and inside-video search. For tablets, we create an encoding optimized for touch interaction and the smaller tablet screen size. This encoding also supports multiple video streams and inside-video search. For smartphones, we create a video podcast. And for iPods and other audio-only devices, we create an audio podcast. Anytime someone plays the video, Panopto automatically detects the device and serves the optimal format. As with every release, we’ve made other updates across the platform. 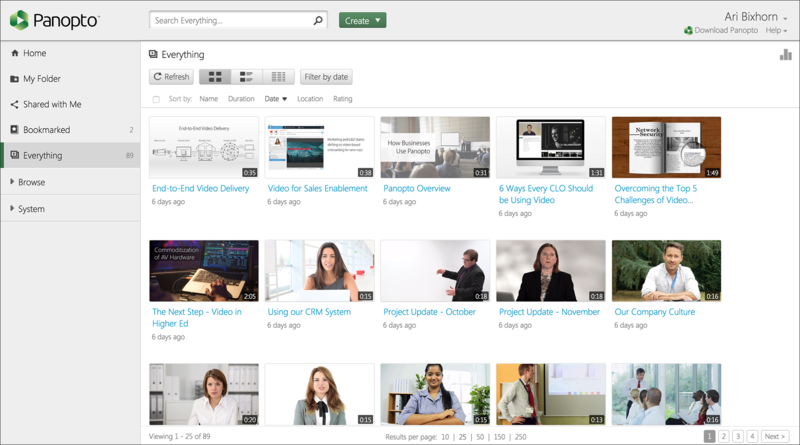 In 5.2, these include improved folder selection and a grid view in the video CMS. Folder Navigation — Within Panopto for Windows, we’ve added a new folder control that makes it easier to select the folder where your video will be uploaded after recording. The Panopto for Windows folder selectorGrid View — In addition to List and Thumbnail views, our Video CMS now includes a Grid View. Grid View provides a YouTube-like UI for accessing videos in any folder that you have permission to access. If you’re interested to find out more about what’s new in Panopto 5.2 or about how our video platform can help your organization capture, manage, and search video more efficiently, contact our team for a demo today.